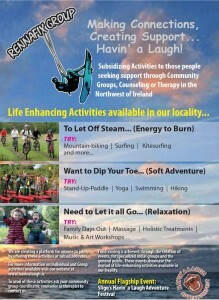 February’s Spotlight is local charity Rennafix, who assist with the promotion of positive mental health through outdoor activities , connecting people, and “havin’ a laugh”. Rennafix Group is an organisation inspired by the life of local action man Paul Rennick. Due to the ever increasing awareness of the positive affects of exercise, the outdoors and community-based activities on Mental Health, Rennafix endeavors to subsidize life-enhancing activities to community groups and those seeking counselling and/or therapy. Activities available through Rennafix in Sligo/Leitrim include mountain-biking, surfing, kitesurfing, stand-up paddleboarding, walking , yoga, swimming and much more.